KALAMAZOO, Mich. — A seconds-long interaction between a customer standing outside a local Kalamazoo barber shop and a public safety officer has led to a firestorm on social media. It was around 5:30 p.m. Friday when a Kalamazoo Public Safety officer rounded the corner at Douglas and North and made a hand gesture towards a man who recorded it on camera. The Facebook post on King Mansa Musa's page has already been shared more than 2,000 times. The message with the post reads, "So while standing outside the barbershop waiting for my turn I captured this...... 'Feeling threatened.'" FOX 17 spoke with Kalamazoo Public Safety Chief Jeff Hadley Friday evening, who said his department is aware of the social media post and the attention it's receiving. 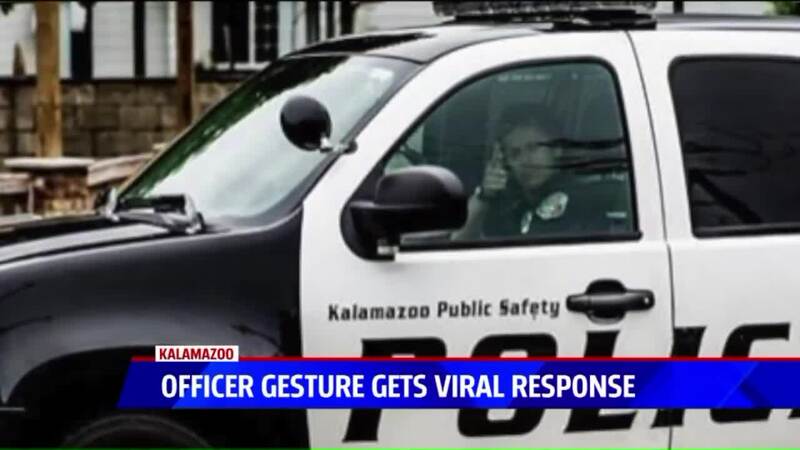 Hadley told FOX17 the officer told public safety officials the gesture was meant to be a "Hello back" after believing the man who took the pictures had waved to the officer to say hello. The officer told public safety officials the gesture was made with no ill intent or malice and in no way was meant to make any kind of gun gesture towards the person outside the barbershop. The incident is now under internal review, Hadley told FOX17. The department plans to review the officer's patrol vehicle dash camera video as part of the review. Hadley told FOX17 interaction took place after the officer had been dispatched to back up another officer during a traffic stop.